Have you dreamt about seeing polar bears in the wild? Are you curious about our changing planet, and the wildlife we share it with? Are you looking for a profound travel experience that also supports conservation efforts? 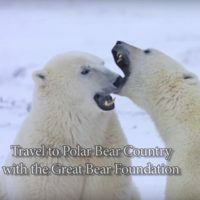 Travel with the Great Bear Foundation to Churchill, Manitoba in 2018 to experience polar bears, beluga whales, northern cultures, and the unique, rugged beauty of Hudson Bay. Spend time in a place where people and polar bears coexist, and the tundra supports a diversity of life. It’s time to register for our 2018 field courses. These trips are open to the public, and aim to connect people to the Arctic in a way that can transform a person’s experience of the world around us. Space is limited, and field courses can fill up quickly! Early birds can take advantage of better travel fares. Our summer trip to the Arctic is timed for beluga whale season, when the whales have their calves in the Churchill River, where they feed on capelin and seek shelter for their young. The trip includes a whale-watching boat tour. Explore the beaches, tundra, and boreal forest, looking for polar bears, fox, caribou, and diverse bird life. Our fall polar bear trips coincide with peak polar bear season in Churchill, as the bears migrate to Cape Churchill, waiting for the first sea ice to form, to break their summer fast. When the ice forms, the bears can return to the ice to hunt their staple food, the ringed seal. Our October course offers an overview of arctic ecology with a focus on polar bears, while our November course sheds light on how humans and polar bears share habitat. All field courses primarily focus on observing polar bears in their natural habitat, while minimizing our impacts on the bears and their habitat. Evening lectures, slideshows, and guest speakers complement our field observations. Graduate or undergraduate credit in Environmental Studies is available from the University of Montana at no extra cost, with additional coursework. All proceeds directly fund our bear conservation initiatives. Sign up today!